The MFC-7440N is relatively noisy when operating, but it backs this commotion up with a decent turn of speed. On the face of it, the Brother MFC-7440N is a surprisingly well-specified MFD. It's a monochrome laser design with a fax and 10/100 BASE TX networking, with the added bonus that the scanner works in colour. Clearly that's no help if you're using the Copy function, as the printer only does black and white, but it's handy if you're saving scanned images on your laptop. 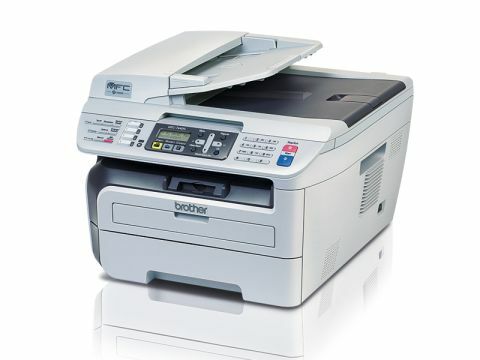 It's a new model, but the MFC-7440N will be immediately familiar to anyone who has previously used a Brother printer. The control buttons are rubber, the software is Brother's MFL-Pro Suite and the two-row mono LCD display has no backlight. Brother supplies the printer with a standard toner cartridge that has a life of 1500 pages. A replacement costs £28 (1.9p per page) and a high-yield cartridge costs £44 and lasts for 2,600 pages (1.7p per page). The other consumable that you might need in time is the drum, which has a life of 12,000 pages and costs £50, so that adds 0.4p per page. Although the Brother is reasonably large, it has a tiny output ledge for the printed pages, but there doesn't seem much danger of the paper falling off. The quality of the printed pages told a different story as the Brother cannot match the quality of some of its peers. But you can only see the difference in a direct comparison and we're sure the Brother will prove to be perfectly satisfactory. The UK SRP of this new printer is rather steep at £213 and, while we shouldn't speculate about the street selling price, we hope it will be significantly less than £200. That would make it better value than some rivals as you essentially get networking and fax for free, but the Brother feels rather crude and isn't especially nice to use.